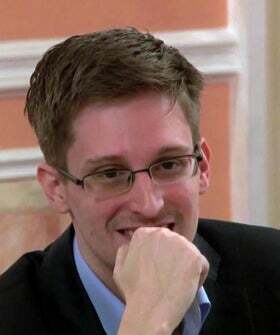 In an exclusive interview with the New York Times, ex-National Security Agency contractor Edward Snowden claims he has not taken any secret files with him to Russia, where he is currently in hiding from the United States government. Snowden kicked off a global spying scandal when he leaked documents, first published in May, about the NSA's espionage operations. The whistle-blower told the Times that he handed over all of the classified documents in his possession to journalists — including filmmaker Laura Poitras, Ewen MacAskill of the Guardian, and former Guardian columnist Glenn Greenwald — in Hong Kong before he flew to Moscow. Snowden assured that Russian intelligence would not be able to access any of them. He also said that, thanks to his background in cyber-counterintelligence, China's spies could not access them, either. "There’s a zero percent chance the Russians or Chinese have received any documents," he said. The interviews took place in the span of a week, using encrypted emails. Snowden told the Times that he believed he "was acting in the nation’s best interests by revealing information about the NSA’s surveillance dragnet and huge collections of communications data, including that of Americans," according to the paper. His disclosures, he said, were far less dangerous than the continuance of these operations by American intelligence.